Although Microsoft’s Edge browser normally seems to do a good job, it is not without its problems. Recently, for example, I installed the latest Windows 10 technical preview and immediately started experiencing problems with the Edge browser. Namely, the browser lost its ability to play sound, and I ceased to be able to download files. As such, I thought that this might be a good opportunity to write about a few techniques for repairing problems related to the Edge browser. Before I get into talking about some of the more general techniques that you can use to fix the browser, I wanted to spend a little bit of time talking about the sound issue. The reason for this is that Microsoft has introduced some new features related to sound, and if not properly configured, those features can be the source of sound-related problems. So what are these new features? Well, Microsoft has given us the ability to mute sound for individual browser tabs. This is a fantastic new feature. After all, nobody enjoys listening to the sound of an ad being played on another browser tab while they are trying to watch a video or listen to music. As great as this new feature is, however, it is easy to accidentally mute a browser tab, thereby creating the illusion that the sound has stopped working. Muting (or unmuting) a browser tab is easy. Just right-click on the tab at the top of the browser window. As you can see in the figure below, the shortcut menu contains an option to mute the browser tab. It is worth noting that the Mute Tab option is not the only setting that can cause the browser to stop playing sound. Sound can also be impacted by the mixer being configured incorrectly. As you are no doubt aware, Windows 10 displays a sound icon in the system tray, located in the bottom right corner of the screen. Clicking on this icon allows you to select the playback device, and to change the sound playback volume, as shown in the next figure. 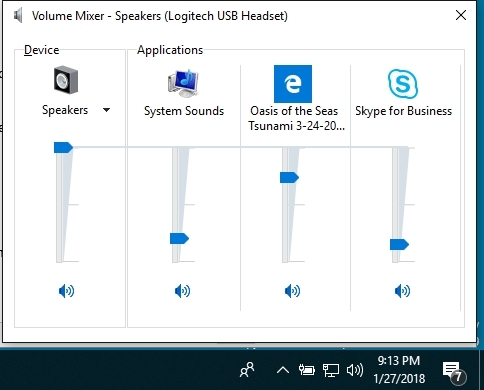 Right-clicking on this same icon provides a series of menu options, one of which is the volume mixer. When you open the mixer, the operating system displays sound controls for several different applications, including Edge. The problem is, however, that the mixer control may not be completely reliable. Let me show you what I mean. If you take a look at the next figure, you will see that I have the sound mixer open and that it contains an icon for the Edge browser. You will also notice that the Edge icon mentions Oasis of the Seas. The problem is that the name listed on the browser icon refers to a YouTube video that I watched about an hour before taking the screen capture. I don’t even have YouTube open in any of my browser tabs, and yet the sound mixer still references a specific YouTube video. If you want to gain better control over the browser’s sound, right-click on the sound icon and choose the Open Sound Settings option. This will open Settings and take you to a screen containing a number of sound related settings. If your sound problems are not specific to Edge, then you might begin the troubleshooting process by clicking the Troubleshoot button, shown in the figure below. If the problem is specific to Edge, then click on the App Volume and Device Preferences option instead. 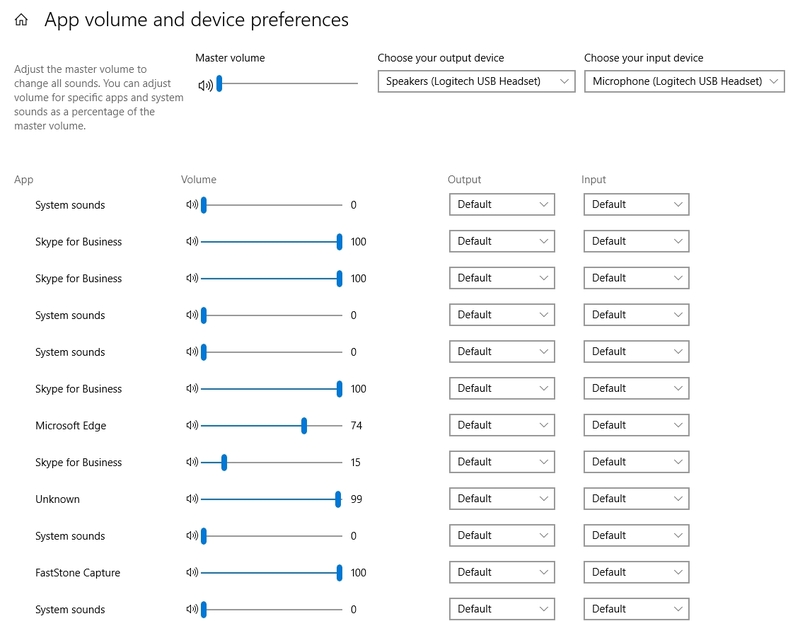 The App Volume and Device Preferences screen allows you to set the sound input and output device on an application by application basis. You can also set the volume for individual applications, including Edge, as you can see in the next figure. I have spent quite a bit of time talking about how you can diagnose and correct sound problems within the Edge browser, but what if these fixes don’t work or what if you are having a different type of browser problem? In many cases, it is easy to fix the problem. Before I show you how it’s done, however, make sure that you have installed the latest updates for Windows. The techniques that I am about to show you are specific to the Windows 10 Fall Creators Update. So with that said, click on Settings, and then click on Apps. 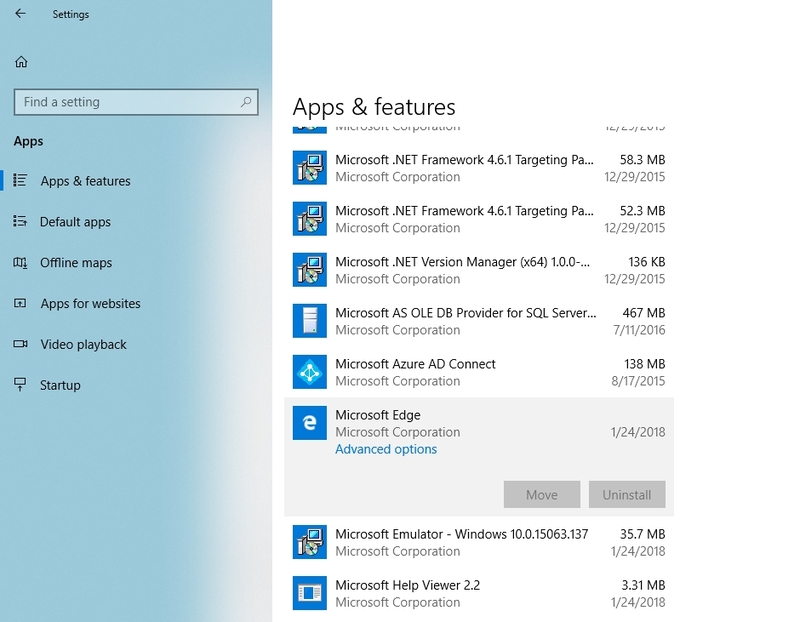 When you do, you will find that the list of apps now contains an entry for Microsoft Edge, as shown in the figure below. 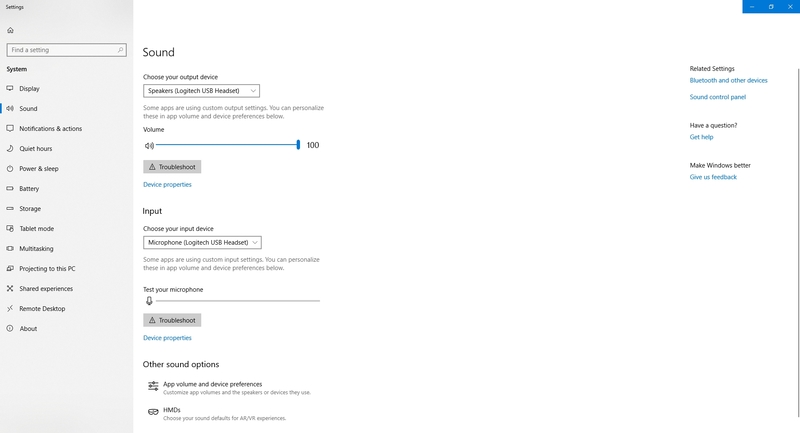 Click on Microsoft Edge, and then click on the Advanced Options link. At this point, Windows will display a settings screen for Microsoft Edge. At first, these settings probably won’t seem all that helpful. However, not all of the settings fit on the screen (at least not on my computer), so you will need to scroll to the bottom of the window. Here you will find options to repair and to reset your browser, as shown in the next figure. 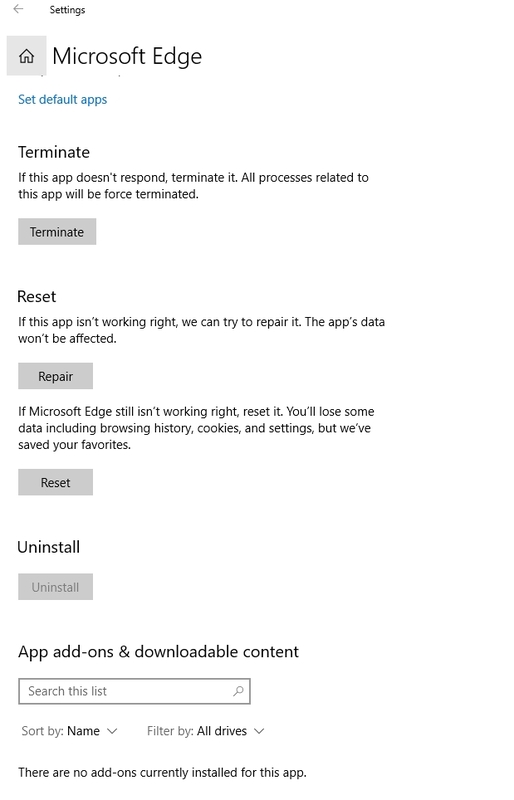 I recommend that you try to repair Edge before resetting it. Repair is a relatively benign function, whereas the Reset option can cause data loss. Even though Microsoft Edge usually seems to work OK, problems sometimes do occur. When that happens, you can try to resolve the issue through individual browser settings, or you can repair, or even reset the browser. I don't use Edge a lot, but over time I have used it enough to notice good improvements in its performance, stability, and features. Unfortunately most users have already settled on Chrome as their go to browser and nothing Edge offers really changes that thinking. Mozilla seems to have the same issue with Firefox because its make over of Firefox with Quantum definitely was a positive for the browser. But has yet to get back many users who probably ended up switching to Chrome. 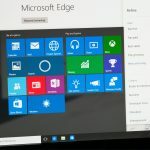 I think Microsoft will eventually try and implement more services and features that require Edge or at least prefer Edge over other browsers. Web Apps and cloud services through Microsoft appear most likely targets as well as Cortana and Windows 10. But this exclusiveness could trigger another EU reaction of unfair practices. You may be right. We will just have to wait and see.